Justin Smith is the Woodland & Wildlife Officer for Bristol City Council and is also the Vice Chair of the Avon RIGS Group. We talk to him about his work in habitat management and how this involves RIGS. Hi Justin. Can you tell us about your background and how you got into the role of Woodland & Wildlife Officer? From a young age I had a passion for natural history and went on to study geology at Exeter. After graduating, I started off working in environmental consulting, before moving into the voluntary sector, undertaking wildlife conservation and learning about the natural world. I subsequently took on a role with Avon Wildlife Trust, which lead to me becoming the council's Woodland & Wildlife Officer three years ago. I also undertake some freelance ecological consulting, specialising in fungi, lichen and bryophyte (mosses and liverworts) surveying. The work that comes with the role varies tremendously by season. The majority of scrub clearance and woodland work is carried out in the winter months for a variety of reasons: trees and scrub are essentially dormant after their leaves have fallen and so there is less stress, when cutting, on their growing systems; there is less inconvenience for park users; and we avoid disturbing nesting birds. In the summer I divide my time between planning for the next winter and carrying out habitat surveys. Does your work involve volunteers or community groups? Much of the labour that comes with habitat management is done by a not-for-profit organisation called Blue Skies. They coordinate and employ ex-offenders and people on community payback to carry out ground maintenance work. Not only is this a cost effective arrangement for the council, it also gives the people involved a chance to pick up new skills and take an interest in their local environment. In successful cases, this can lead to people obtaining placements at other organisations, and offers a chance to break the cycle of repeat offending. Can you give an example of a nature conservation success story that you were involved in? A site that springs to mind is Hawkfield Meadow in south Bristol. This was an area of species-rich meadow that was neglected for 15 years and was under constant threat of development. In the 1990s, some of the land was built on and the small section of meadow that remained was gradually scrubbing over, thus decreasing its nature conservation value. There was a very real risk the site would be lost altogether. 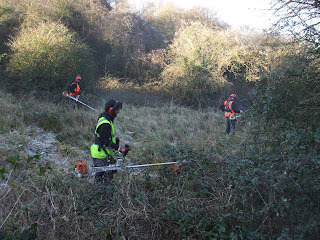 In 2010, the newly created Woodland & Wildlife team came in and cleared a substantial amount of bramble and scrub, put in footpaths and took measures to ensure the site could return to meadow. 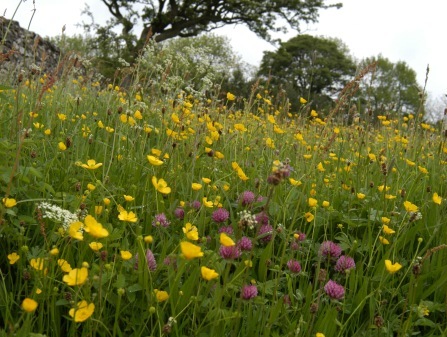 There is a still lot more to do in terms of public access, but the team has recently ensured that the meadow is cut once a year to maintain as hay meadow; this should encourage less competitive, and often rarer, species to colonise and spread more successfully. How does geology, and more specifically RIGS, come in to your work? RIGS exposures are commonly found as cuttings next to paths in woodland areas and can often become overgrown. A heavy prune of a small section can be as little as half a day's work, and often may not need to be done again for 3-5 years. Clearing vegetation from outcrop faces can also be used to increase the amount of exposure to increase a site’s educational value. Fir Woods RIGS, Clevedon, before and after management. Once cleared of ivy, the outcrop revealed an unconformity between Carboniferous Limestone and Triassic Dolomitic Conglomerate The Avon RIGS Group is working with North Somerset Council to establish regular clearance as part of a management plan for RIGS sites. Are there ever conflicts of interest within the scope of habitat management? This is something that is close to my heart given my interest in lichens and fungi! All wildlife rich sites have to balance the needs of their various components, and not all conservation measures are necessarily beneficial for every aspect of a site. If a RIGS is covered in an exceptionally rare moss, how do we determine which is more important? The exposure of an important geological formation or the preservation of the plant? Luckily this particular example is not a common occurrence because, in reality, brambles and ivy do the most damage to rock units. And finally, what is your favourite Avon RIGS? It has to be the road cutting on the Clifton side of the Clifton Suspension Bridge on Bridge Road. Here, the Clifton Down Limestone is exposed and contains Lithostrotion corals, calcite veining and a small number of quartz geodes. There is also botanical interest with a wild plant display of the rare flora (such as Autumn Squill) that thrives in the Avon Gorge.